When it comes to office signs, consistency is key. Beyond a contemporary look for your office doors, cubicles and meetings rooms, a universal design to your office signs and interior design is crucial. Believe it or not, aesthetics is a key element to your first impression you make with customers, guests or any personnel visiting your office, waiting room, law firm, etc. Take it from major interior designers that use our sign products in their office decorating and office designs for their customers . 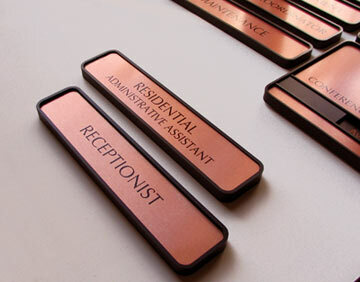 At Office Sign Company, we offer a choice of contemporary metal sign colors, dry erase signs as well as customizable text options for any conference room sign, waiting room or employee name plate. The only thing stopping you is your imagination - you can literally add any color, text or graphics to any one of our sign and name plate products. Sign personalization has NO limits! Again, keeping your restroom, office, conference room and meeting room signs consistent in look will not only enhance your office environment, but will also display a level of professionalism to your customers and clients. Our custom office signs are used by law firms, hospitals, fortune 500 companies, government agencies and businesses nationwide. Architecture firms and interior design groups have also used our products to create a contemporary and consistent look to their office sign projects. Our signs not only look great but are functional as well. 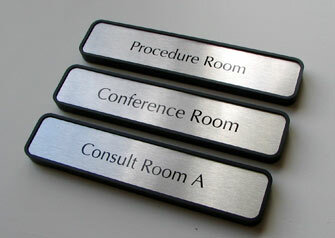 Our conference room slider signs let others know if any employee or meeting room is available at a quick glance. Call us today for any interior sign, desk name plate or office sign need - (701) 526-3835. Or get a fast response by emailing any inquiry to our Service Team.